The Saskatchewan Roughriders came into Toronto on Thanksgiving Monday with their sea of green supporters looking on and handed the Argos’ a painful 36-10 loss. The Roughriders came out flying on Monday afternoon at Rogers Centre. Saskatchewan running back/ kick returner, Brandon West returned the game’s opening kickoff 81 yards, resulting in a 17-yard Sandro DeAngelis field goal. 3-0 Riders early on. On the ensuing Riders’ offensive possession, Darian Durant would orchestrate a 56-yard drive, capped off by a 1-yard touchdown plunge by backup quarterback, Drew Willy, extending Saskatchewan’s lead to 10-0. The Argonauts’ would counter with a big return of their own as Chad Owens scampered 44 yards, setting up a 48-yard Swayze Waters field goal, cutting the deficit to 10-3. Saskatchewan would re-establish their ten-point lead on a 45-yard Sandro DeAngelis field goal early on in the second quarter. Jarious Jackson would finally get the Argonauts’ into the end zone at the five-minute mark of the second quarter. Jackson orchestrated a seven-play, 94-yard drive capped off by Gerald Riggs’ first touchdown of his CFL career. With just over a minute remaining in the first half, Darian Durant led a 56-yard drive that stalled at the 1-yard line, as Drew Willy was unable to plunge into the end zone past the Argonauts’ defence. The Riders’ would settle for another Sandro DeAngelis field goal, extending their lead to 16-10. DeAngelis would make good on another field goal in the final seconds of the second quarter and go into halftime holding a 19-10 advantage over the Argos’. The Argonauts spent a majority of the first half on their side of midfield, as they were unable to win the field position battle. Head Coach, Scott Milanovich noted prior to Monday’s game that it was important for the Argonauts to control time of possession and field position in order to beat the Riders. The Argonauts’ accumulated only 11:30 of possession in the first half to Saskatchewan’s 18:30. The Riders’ opened up the second half similar to the first as Sandro DeAngelis connected on another field goal, this time from 31 yards away, extending the Riders lead to 22-10. Saskatchewan would grab complete control of the game in the third quarter as Kory Sheets and Weston Dressler each recorded touchdowns, stretching the lead to over 20 points. Sheets’ 48-yard touchdown run is the longest rushing play of the season for the Roughriders and now gives him nine rushing touchdowns on the season. Dressler’s 78-yard touchdown is the longest offensive play of the season for Saskatchewan and propels Dressler to first in the Canadian Football League in receiving yardage. Jarious Jackson was unable to find a consistent rhythm all afternoon and was ultimately benched in favour of Trevor Harris at the five-minute mark of the fourth quarter. Jackson struggled throughout the football game and finished 16-for-31 with 162 yards passing, one touchdown, and one interception. Harris finished the game 1-for-5 with just three yards passing. However, their counterpart, Darian Durant had a successful trip to Toronto as he finished the game an efficient, 21-for-29 with 276 yards passing, and one touchdown. The Argonauts’ struggled with discipline on Monday afternoon as they took fifteen penalties resulting in 180 free yards for the Roughriders. There was certainly no silver lining in this loss for the Argonauts. Toronto struggled in all aspects of the game on Monday afternoon. After this colossal defeat, Argos’ fans will definitely be eager to see Ricky Ray back on the football field as soon as possible. Ray’s status is still day-to-day and the Argonauts’ hope that he can make a return to the lineup next weekend at home against the Alouettes. Chad Kackert was also absent from Monday’s game due to lingering injuries suffered last weekend in the Argonauts’ 29-10 victory in Winnipeg. Gerald Riggs stepped in and recorded ten carries for 56 yards as well as three catches for twelve yards and a touchdown. Riders’ kicker, Sandro DeAngelis was 5-for-6 on field goal attempts, with his only miss of the game coming late in the fourth quarter with the victory already firmly secured. 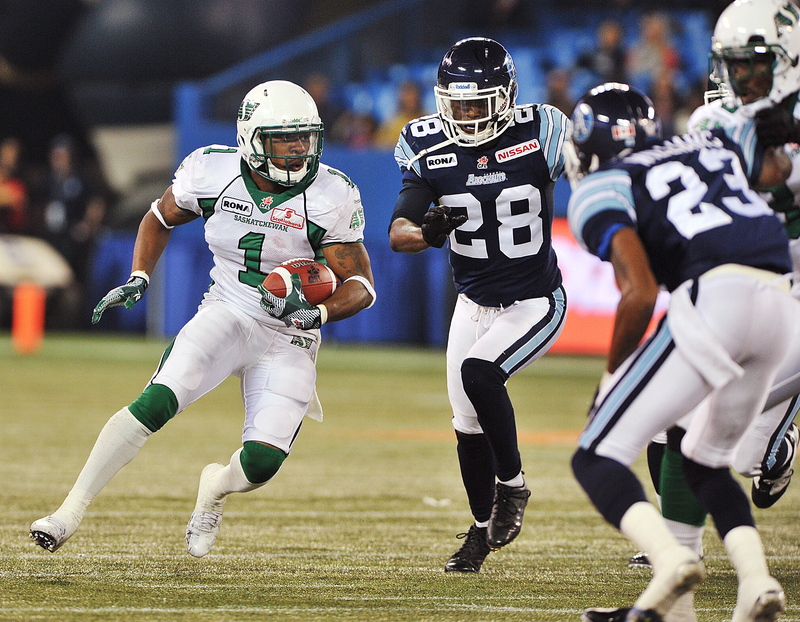 Andre Durie led all Argonauts’ receivers with four receptions for 51 yards. Cornerback, Pat Watkins led all defenders with six tackles in the game. The Argonauts’ fall to 7-7 heading into a crucial matchup with the Montreal Alouettes next weekend in which a victory will secure the season series over the Als.